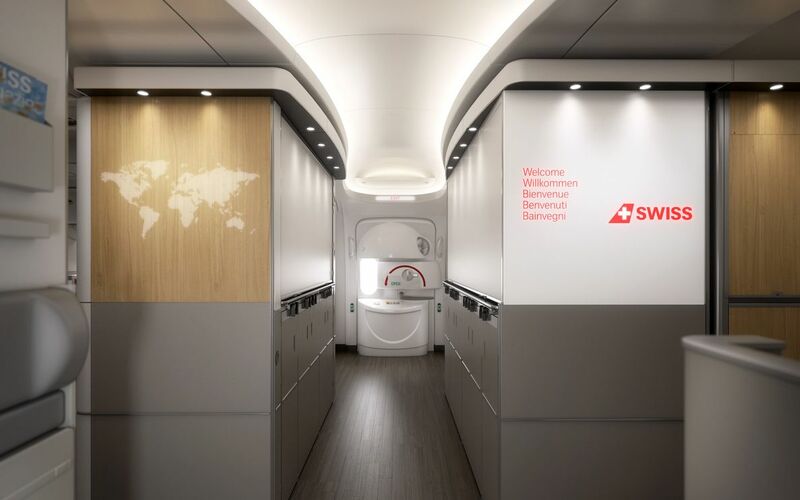 Step inside the first Swiss Boeing 777-300ER, featuring all-new first class suites and business class seats, along with super-styled cabin interiors. 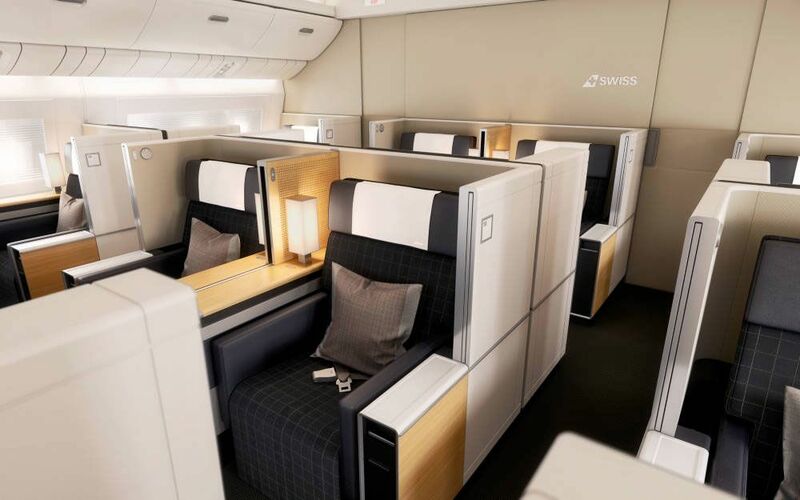 Shaped by leading design house PriestmanGoode, the new seats are a natural evolution of Swiss' award-winning cabins – but with more space, more storage and greater privacy. 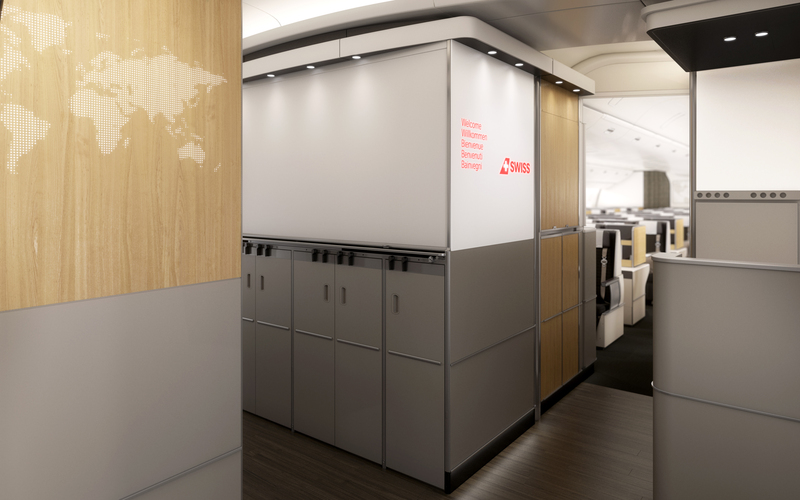 The colour palette throughout the cabin has been updated to richer, more sophisticated tones, while keeping very much on-brand for that unmistakeable Swiss look and feel – even in the entrance to the Boeing 777, which is a little more like a reception area. "We took inspiration from Switzerland’s design and craft heritage, as well as Swiss’ own brand identity, including the airline’s headquarters and flagship lounges in Zurich" says Nigel Goode, Co-Founding Director of PriestmanGoode. 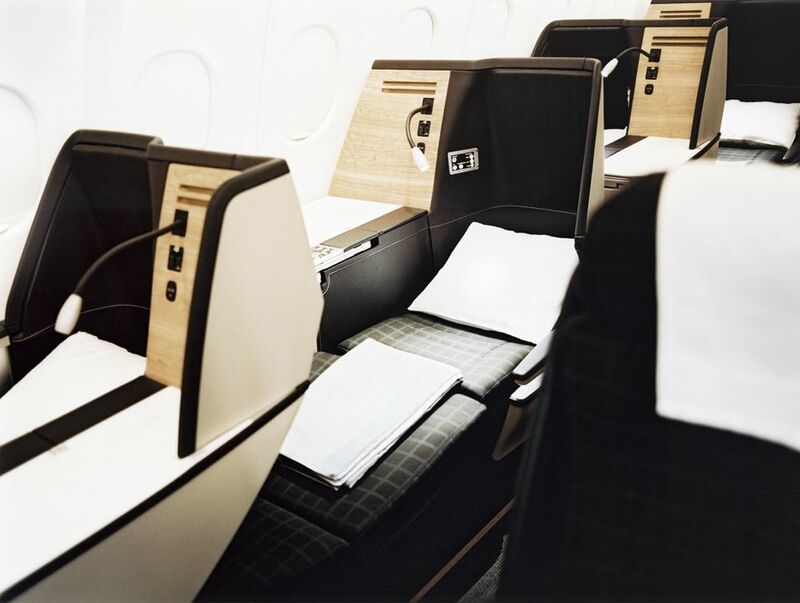 Eight spacious private first class suites are nestled into the nose of the Boeing 777. 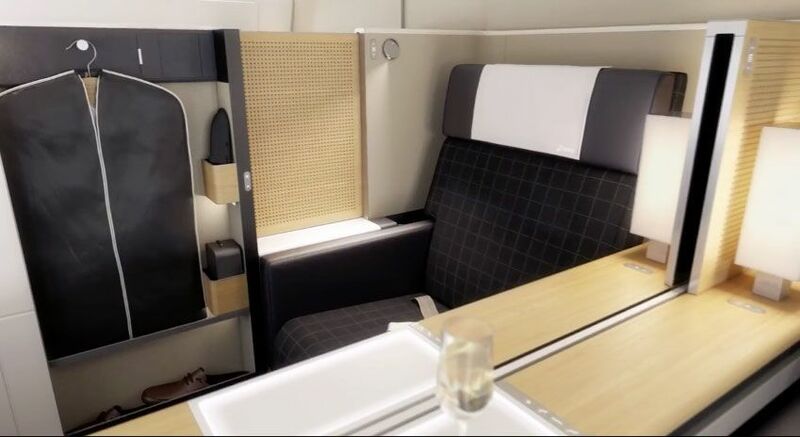 Each exudes a warm 'colour and materials' palette of browns, greys and accents of European oak wood, while soft walls, woven fabric bulkheads and curtain screens help damned noise in the cabin. 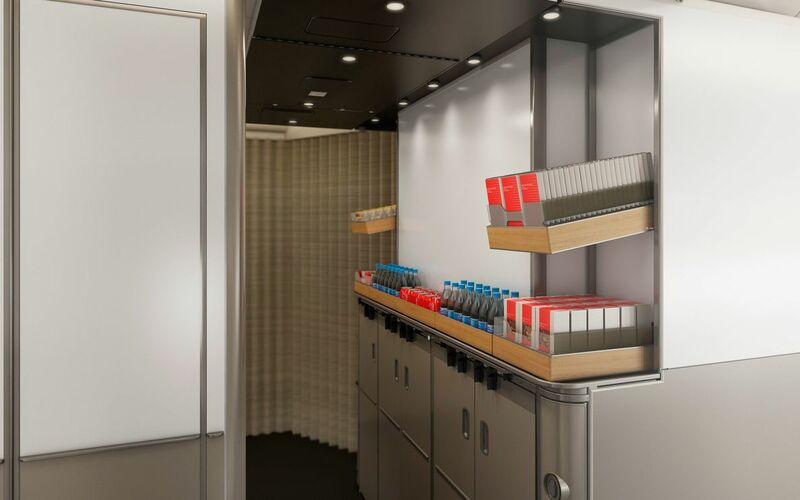 There's a 50% increase in personal storage compared with the previous first class seat, including dedicated storage for amenities. 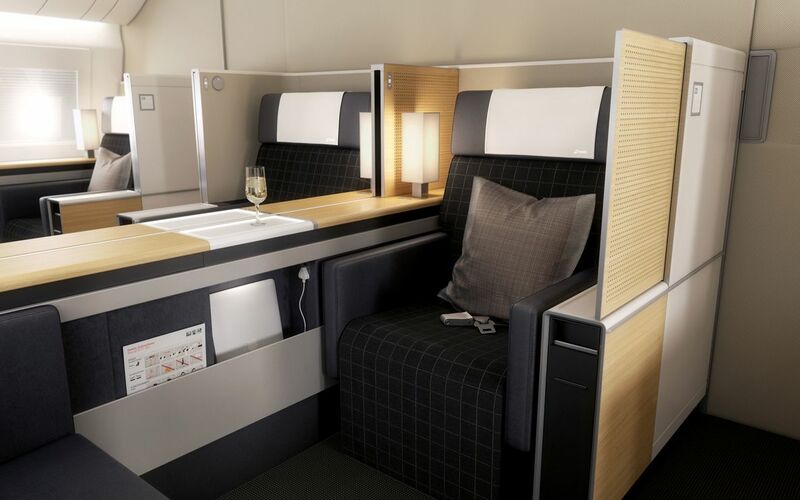 Luxe touches such as a 32 inch video screen, reading lamp and cocktail table surface with integrated lighting – plus electrically-adjustable blinds if you're at a window seat – help turn each suite into your own inflight haven. 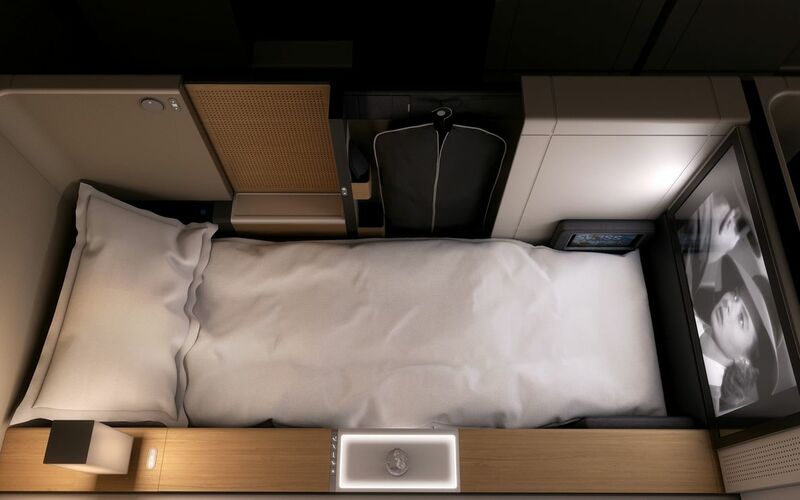 Each passenger has their own personal wardrobe, with a sliding door which creates a partition between the seat and the aisle to offer greater privacy. 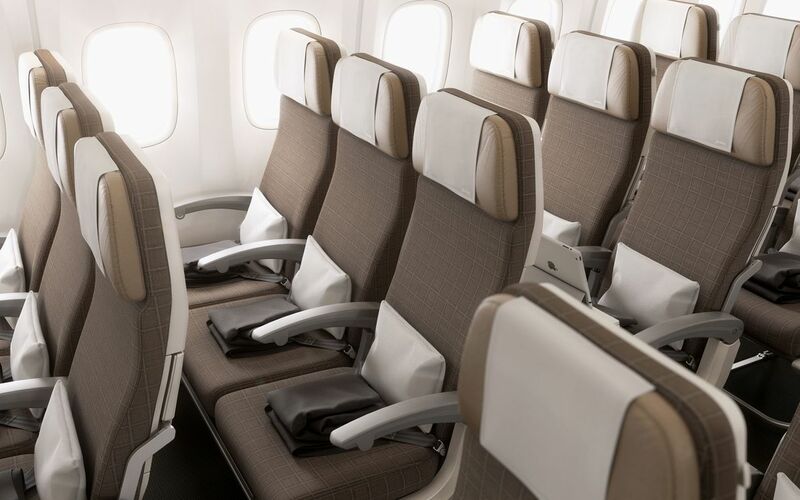 The 62 business class seats represent a measured evolution of the current and highly-regarded design rather than a radical make-over. 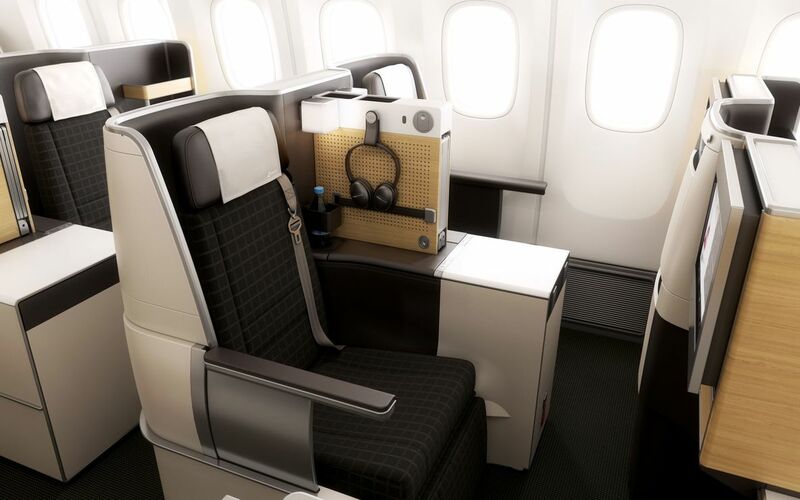 New features include headphone hangers and straps for storing tablets and magazines, along with more personal stowage. 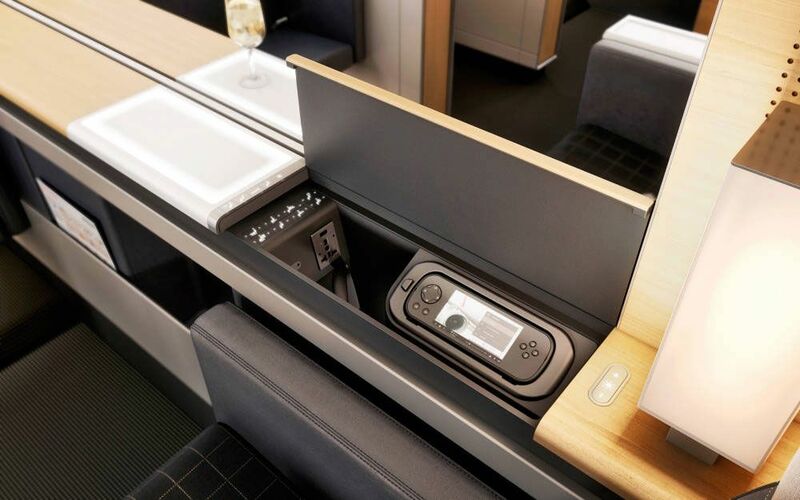 "The current product is a good product, but of course there are always little things you can optimise," Swiss CEO Harry Hohmeister tellsAustralian Business Traveller. 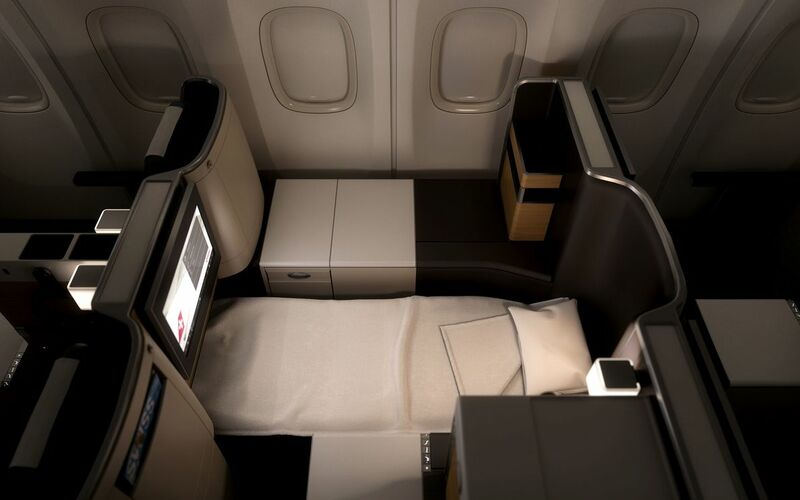 As you'd expect, each seat converts into a fully flat bed that's over two metres long. 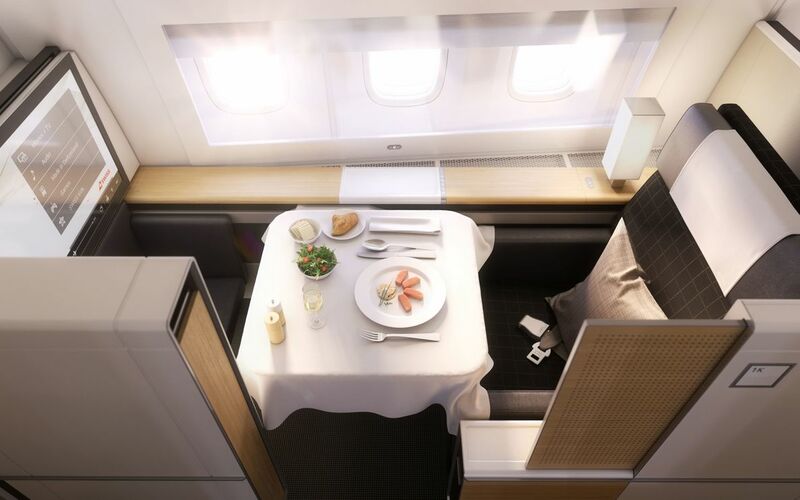 Also on Hohmeister's plan for premium passengers are "more individual services on board and in the lounges. It's a huge investment in the customer." Travellers down the back of the bus can visit a self-service kiosk stocked with drinks and snacks. 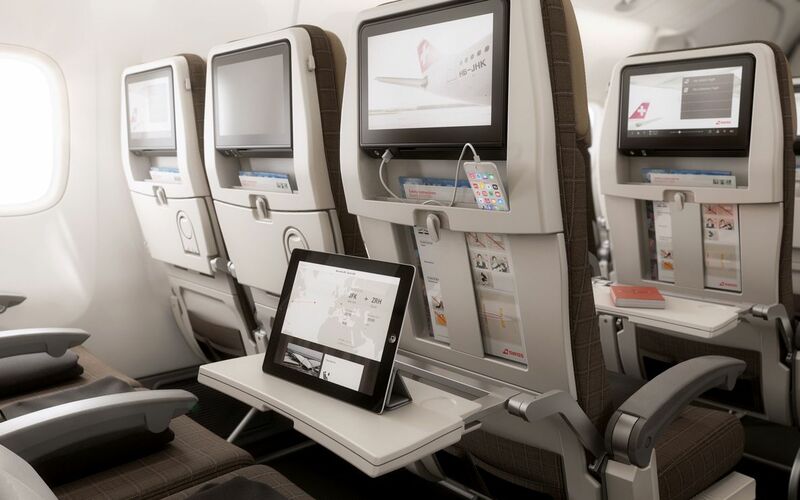 The 270 economy seats each have a large touchscreen monitor plus USB sockets. 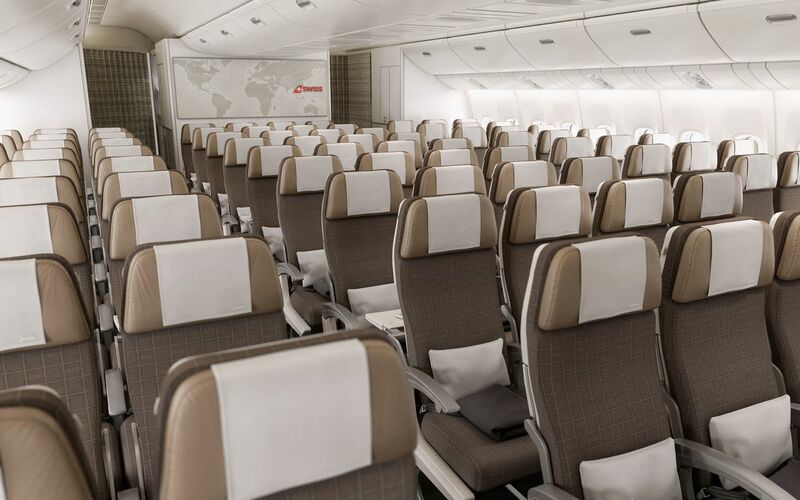 Swiss will fly its first Boeing 777-300ER in January 2016 – "only six months to go! ", Swiss CEO Hohmeister smiles like an eager kid counting down the sleeps to Christmas – with five more to follow by August, "and then three more during 2017-18." 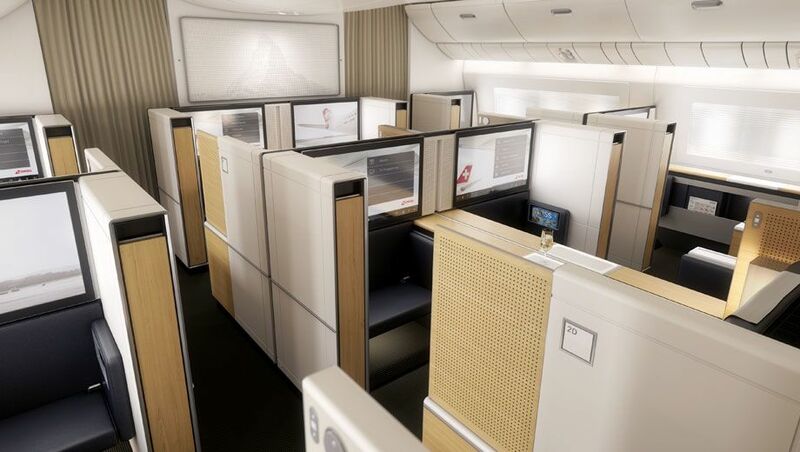 The first Boeing 777-300ER in the fleet will take wing in January 2016, and after European proving and familiarity flights the large twin-engine jets will start to appear on routes to Hong Kong, Bangkok and Los Angeles, plus some flights to San Francisco, São Paulo and Tel Aviv. 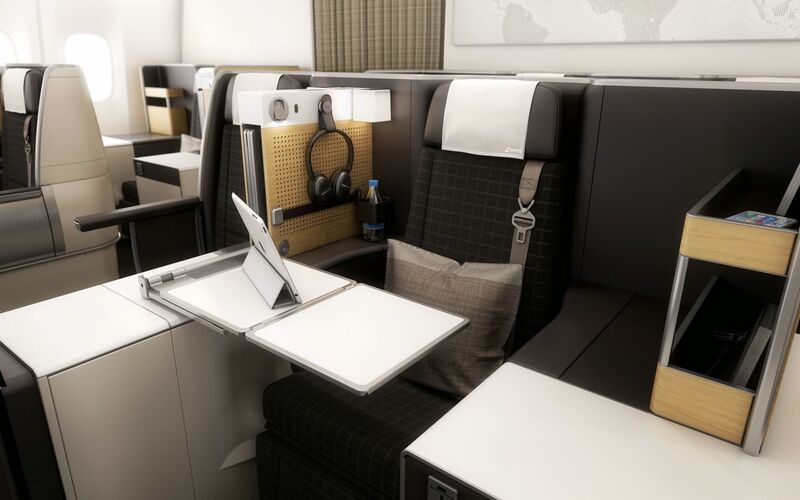 "The Boeing 777-300ER changes our economics compared to the Airbus A340, which is giving us more opportunity to engage ourselves in Asia again, because the Asian markets are very much under pressure by the Middle East carriers," Hohmeister explains. 2016 will be about "a 1: 1 rollover" as cities served by the fuel-guzzling four-engine A340 are upgraded to the Boeing 777-300ER. "We want to bring more efficiency to the destinations we are flying to already, and from there we have to see where else we can develop the network. Based on higher efficiency and high profitability we also can grow to new destinations, but that’s not something for 2016." Edited by AF085, 09 de July de 2015 - 11:48 . A princípio, GRU só no segundo semestre. 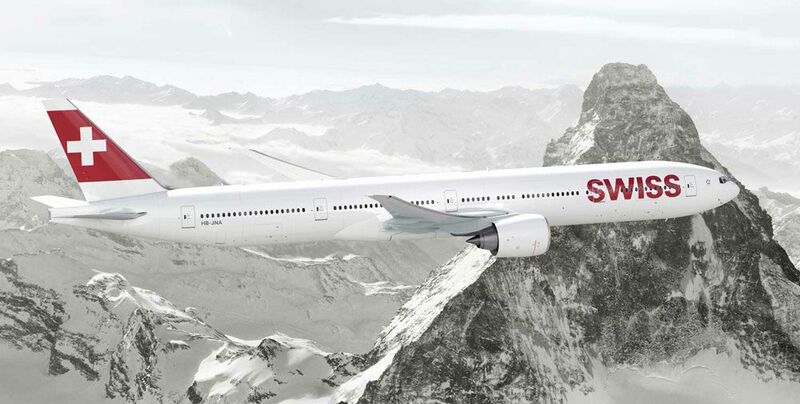 SWISS today (09JUL15) opened reservation for its planned Boeing 777-300ER operation, due to enter the airline’s fleet in 2016. 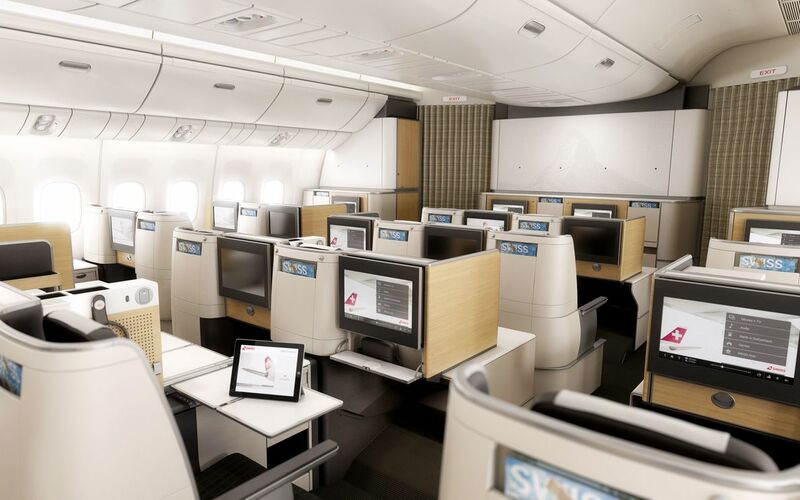 Configuration of the 777-300ER is F8C62Y270 (3-4-3 layout in Economy), operated by SWISS Global Air Lines. Planned Boeing 777-300ER service entry dates as follow. Edited by AF085, 09 de July de 2015 - 11:54 . 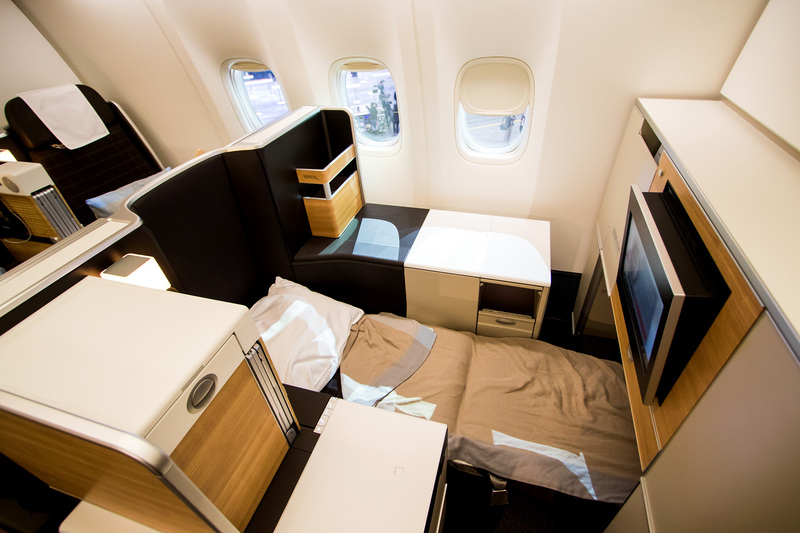 Lindo o interior do B777, minimalista e luxuoso, bem ao estilo suíço, sem aquela extravagância das ME3. Clássico, nostalgico, tradicional..que outros adjetivos podemos encontrar para esse espetacular interior. Uma pena apenas que a business tenha aquela configuração antiga on de os pax da janela não tenham acesso ao corredor sem passar por cima do vizinho. Imagino o custo disso tudo, realmente uma obra de arte. Apenas 12 de 62C não tem acesso direto ao corredor, acho esse numero bem razoável, significa menos de 20% da C! A chance de 20% estar viajando acompanhada é boa o suficiente para justificar a escolha da configuração. GRU deve ser só 3 vps. Os vôos para JFK, YUL e TLV são apenas para treinar pilotos e comissários. HKG, NRT, SFO e GRU serão os destinos fixos, por causa de range e rentabilidade das rotas. Sabe o que acontecerá com o segundo voo de SFO(6x por semana), GRU(3x por semana) e JFK(7x por semana) com a introdução de uma aeronave 55% maior? HKG e LAX serão diários, só aí precisa de 4 aviões. BKK e GRU devem ficar com os outros dois que só chegam no final de 2016. Os 3 últimos serão entregues entre 2017 e 2018, então se GRU passar a diário será a partir disso. Saiu que o 1º será entregue em jan-16, mas olhando na lista de produção, e pela cadência de 8 aviões/mês, o 1º avião ficaria pronto final de nov/início dez-15. O segundo em jan/fev-16, os demais ainda não tem programação. 9 77W é pouco pra substituir 15 A340, porém em termos de oferta de assentos representa um aumento de +33%. Uma evolução, ao invés de uma revolução. ENA: chega as 06 de HKG e segue as 13 horas p/ LAX....chega ainda hoje em LAX e deixa LAX a noite chegando amanha as 16 em ZRH. Concordo Carlos, mas não altera o que eu disse sobre GRU e BKK terem só 3 vps. A LX vai receber 6 aviões até o final de 2016. Ainda tem SFO e TLV, e tem que ter uma folguinha pra manutenção. No segundo semestre voarei na C do 77W da LX e aí poderei comprovar a decepção que tive ao ver as fotos. Os assentos parecem ser menores que os da BA. Isso, a BA usa 8 poltronas por fileira (2-4-2), estreita as pernas de uns pra alargar o assento dos outros. Carrega mais gente mas porque não tem armários. A LX te leva a pensar que são 5, mas na verdade são 10 por fileira (3-4-3).